Trail: Dawson City, Yukon to Eagle, Alaska and return following the Yukon River, with some bush trails depending on the ice conditions. 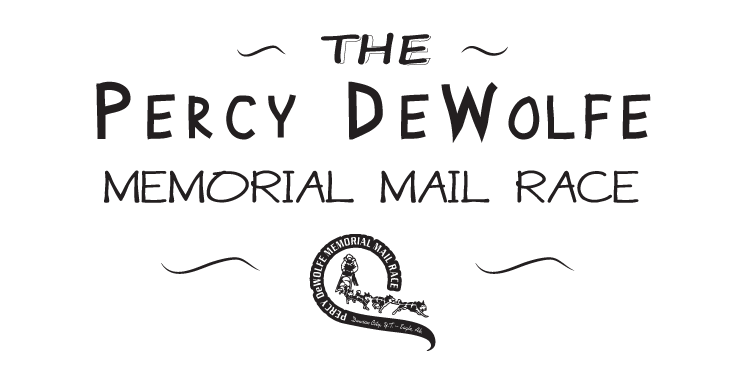 The race follows most of Percy DeWolfe's original dogsled trail. Layovers: Mushers take a mandatory 6 hour layover in Eagle, plus an additional 2 hours in either Fortymile or Eagle. Please bring stove fuel as Eagle cannot supply this. Start: 10:00 am in front of the Old Post Office. Staggered start timed at 2 minute intervals. The first musher to leave the starting line carries a package of mail to deliver to Eagle. Border Crossing Info: This race crosses the Canada/US boarder into the US on the outbound leg, and back to Canada on the return leg. The Percy Race Organization will submit musher information to both Canadian and US Customs prior to the race start; mushers should be prepared to clear US customs in Eagle and Canadian customs at the finish line in Dawson. Please see Race Overview and Rules below for more detailed information. 3rd Avenue and King Street. All teams must be in designated staging spot no later than 9:00 am. Teams deemed by Race Officials to be unmanageable in staging area when they need to be brought to the start chute will not be able to start at their designated start time. In this case, the team will start last, but will be timed from their initial designated start time. "The Percy" race has a timed start at 2 minute intervals. Teams must leave, within one (1) minute of their start time. If unable to enter the chute at their designated time, the team will start last. The team must leave within 30 minutes of their designated start time or be disqualified and forfeit the entry fee. The handler will be allowed to ride and/or assist during start, down to the ice bridge. All mushers are allowed 6 dogs minimum, 9 dogs maximum. No loose leaders. No dogs may be added to a team after the start of the race. Dogs must be in musher's control at all times. No switching of dogs between mushers is permitted. All dogs must finish the race, either in the team or in the sled. There shall be no cruel or inhumane treatment of dogs. (As determined by the Race Officials.) No whips or jinglers permitted. All care and feeding of dogs will be done by the Musher only (except in the case of a Dog Drop). Only mushers may assist one another during the race. No outside assistance is allowed during the race, including checkpoints, unless an emergency is declared and judged so by the Race Marshall. Incidental help at checkpoints is permitted. Teams will be assessed by Race Vet and Race Official as necessary. Teams may not be allowed to proceed until cleared by Race Official. Any pre-existing dog health issues must be identified to the vets prior to the race start. If an issue is not declared before the race and is then noticed during the race, it will be deemed to have occurred during the race. One hour per missing item will be added to Musher's total running time. Teams missing any of these items at the start will not be allowed to leave until they are present. Gear will also be checked in Eagle. An adequate amount of dog food per dog for the duration of the race (3 days worth is recommended). Absolutely no littering anywhere along the trail or at checkpoint. Handlers are required to clean up after teams in the staging area and dispose of waste in designated area. All mandatory gear will be checked in Eagle. Mushers will notify timer/checker immediately upon arrival in Eagle, and have checker note arrival and departure time. Every Musher must personally sign in and out of Eagle. One 6 hour stop at Eagle is mandatory. All dogs, sled, gear and musher must remain at checkpoint area at all times. Mushers may leave sick or injured dogs at the Fortymile Dog Drop. A musher must have at least 6 dogs remaining in their team to continue the rest of the way. Mushers must supply a dog chain or covered steel cable at least four feet in length, one dish and 24 hours worth of food for each dropped dog. Excess food left at dog drop cannot be picked up on the return trip. Mushers must fill out an instruction sheet and sign the waiver. Musher must pick up all dogs dropped when returning to Dawson. Mushers are responsible to leave dog(s) in proper condition, ie. booties and harness off. All Mushers must conduct themselves in a civil and sportsmanlike manner for the duration of the event, from the Mushers' Meeting through to the end of the Awards Banquet. Any infraction of these rules observed may be protested verbally to the next officials on the trail. A written report will also be required within a time frame, as indicated by the race official. If Mushers have vehicles they must be in the finish line vicinity as indicated at the mushers' meeting. Mushers with a vet tube must present it to Race Officials/Vets at checkpoints. Those with priority vet tubes must receive clearance from the Race Official/Vet to continue on the trail. Mushers given a priority vet tube in Eagle must stop in Fortymile and receive clearance by the race official to continue on the trail. Mushers must stop in Fortymile on the return leg of the race, and may be required to rest at the discretion of Fortymile Race Officials/Vets.